Timberland Men's Boots Size 9. Condition is Used. Dispatched with Royal Mail 2nd Class. Dark brown distressed suede leather. Upper shows light signs of wear against distressed colouring. USA size 11W. UK size 10.5. The boots are a UK Size 8.5, wide fitting. However in the area we cover there are more than 1300 children who may need our support, so there is much more to do. Brown Timberland Boots Size 10 used. Condition is Used. Brown Suede. Size 11 UK. When uppers are cleaned they will look like new. No wear whatsoever to soles and heels. Timberland Brown Leather Boots Size 11.5. Condition is Used. Dispatched with Royal Mail 2nd Class. 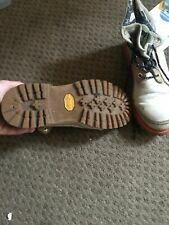 mens timberland boots size 8. Condition is Used, (little scratch on the back of right foot) see picture .Dispatched with Royal Mail 2nd Class.